Today was our first day implementing our summer schedule along with our summer learning activities. I have set-up the day so that when Ceci has her learning time with me, Laila is working on her Table Time work. Then, when Ceci is taking her nap, Laila has her individual learning time with me. Surprisingly, despite it being the first day, everything went smoothly. As promised, I will share some of the activities -- even the flops -- that we did each day. I would LOVE to hear back from people if they try any of the activities. Please leave a comment on the blog -- tell me what works, share new ideas and new activities. I REALLY want to hear from you and learn from you too! 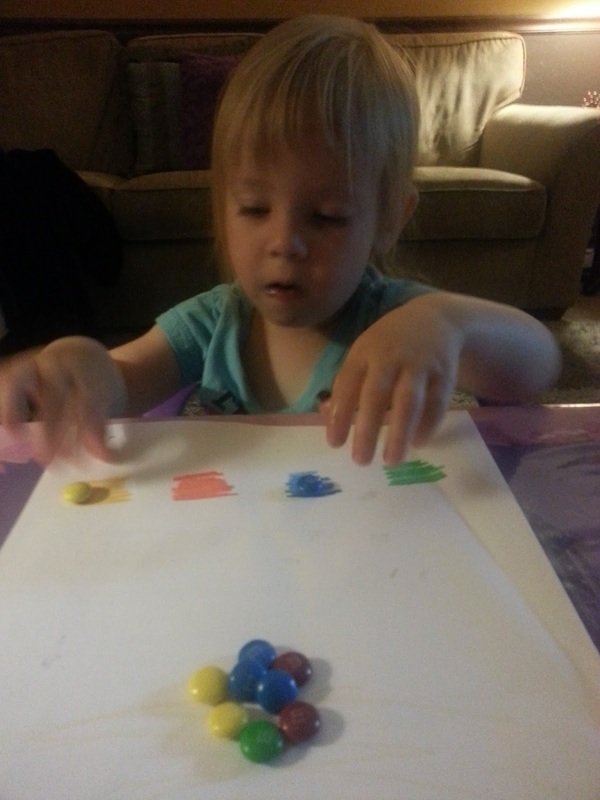 The Toddler -- Ceci's work today focused on color recognition, matching, sorting, counting, and fine motor skills. On a piece of paper, I colored a square for four colors: green, blue, red and yellow. I then gave Ceci an M&M and she placed it on the color coordinating square. As she placed the M&M, we practiced saying our colors, and of course, Ceci ate them as she went. After she got the hang of the activity, we poured out some more M&Ms, and I asked her to get all the blue M&Ms and place them on the blue square, then the red, the green, etc. Once the M&Ms were sorted by color, we practiced counting them. As she finished eating her treat, we read a book about colors. Reflection -- The activity really held Ceci's attention, which was a huge plus. In the future, I will probably try to use something other than M&Ms just to minimize the sugar intake. The 1st Grader -- Today was "Writing Wednesday" for Laila. 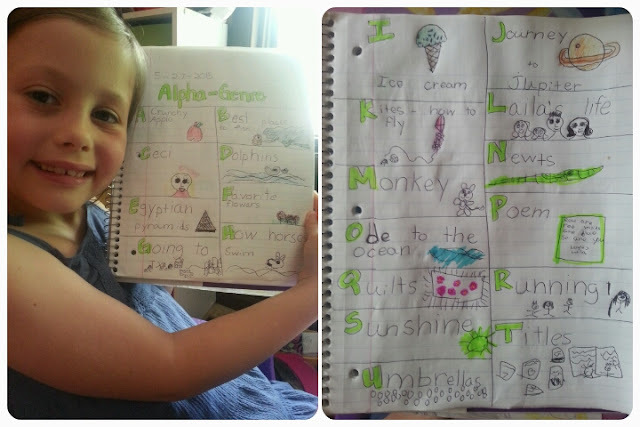 To celebrate our first ever "Writing Wednesday," we started Laila's Writer's Notebook by creating an Alpha-Genre. I read Laila the book "Written Anything Good Lately?" And then we began to brainstorm different topics she would be interested reading, researching, and writing about. As a way to record all of her ideas, we made the Alpha-Genre. 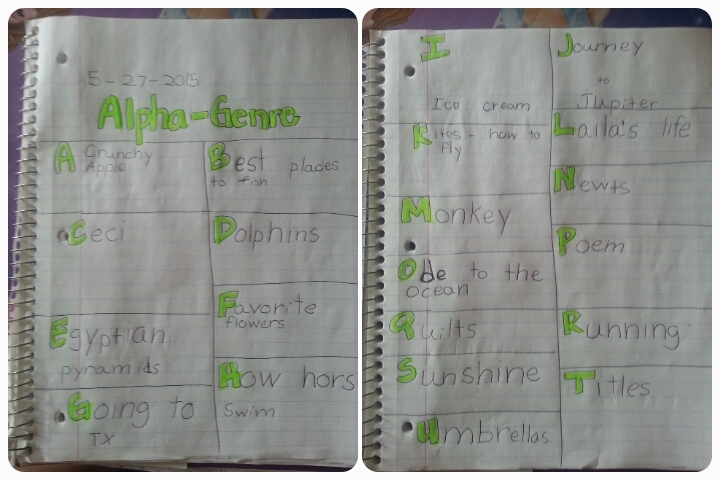 For the Alpha-Genre, Laila brainstormed a writing topic for each letter of the alphabet. She recorded down her topic and drew an accompanying picture. Laila is quite the artist and I have no doubt she will be a writer as well, like her mama! Can't wait to try the color matching with J, I will let you know how it goes! Nicole, please do!!! I would love to see pictures, videos, etc!